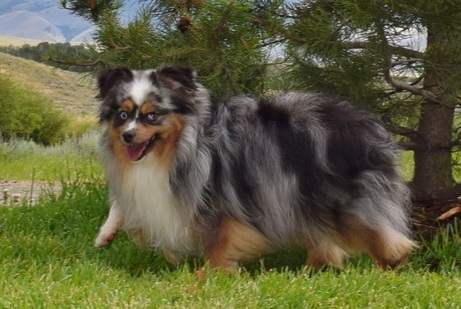 Augie is a 11 1/2" handsome blue merle. He has nice bone and a huge coat. He has been championed with ASDR and IABCA. Super sweet and friendly! Deuce is a 13 1/2" unique blue merle. He is out of 10" and 12" parents and grandparents. His pedigree is full of Champions. Blue is a cute 10 1/2" double blue eyed black tri with a half collar. He is a sweet active boy and loves to ride in the truck. Jaxon is a 13" black tri. He is very active and likes to keep track of what his girls are up to. He has been championed through ASDR. He is blue eye tri factored. Love this little guy! Frank is a 12 1/2" beautiful double blue eyed tri out of blue eyed tri parents. Nice coat and wonderful temperament! Rowdy is a 13" blue merle with 2 gorgeous blue eyes! He is an active boy with a higher drive. Newt is a 11 1/2" blue eyed black tri. Can't stand how cute this little guy is! !